We don't really have a democracy, we have a plutocracy! Jobs, environment, and health suffer. Let's stop outsourcing jobs. Let's reform corporate governance and government! Remember the old joke about The Golden Rule? "He who has the gold, rules." Plutocracy is rule by the wealthy. Even though the general concept of Western democracy is well established at this point, it is those with "the gold"—wealthy individuals and corporations—who have true influence over our laws and regulations. The United States is a democratic republic, which means that we elect representatives who are supposed to follow the will of the people. Unfortunately, due to the influence of big money in politics, the "we" part of "we the people" has become dominated by the richest individuals and corporations. This has serious implications for the long term health of our system of governance, but plutocracy also has implications for our personal health, jobs, safety, and environment. Global corporations are increasingly abandoning their long-established, well trained, well paid work forces in the US and other industrialized countries, transferring jobs to cheaper overseas labor pools. Lower labor costs mean more profits for the corporations, higher share prices for the stockholders, and bigger bonuses for the millionaire and billionaire executives. A couple of decades ago, overseas outsourcing affected mostly manufacturing jobs; today, technical and administrative jobs are also up for outsourcing. The overall effect is a lowering of average income levels for everyone except those at the very top. Proponents of free trade argue that the loss of home-based jobs is temporary, and as people get retrained, the net effect is a positive one because the economy becomes more efficient. But with technology-sector jobs being lost and today's replacement jobs tending to be lower-paying service jobs—when a job can even be found in this new era of high unemployment—the falsity of this concept is now obvious. The effect that this has on the average schmo's standard of living is clear enough, but since family income level is one factor in predicting health, the Schmo family's falling income level will ultimately affect its physical well being too. The US government enables the outsourcing of jobs by pursuing global trade agreements that allow corporate interests to trump national interests, fair-labor requirements, health and safety standards, and environmental laws. Jobs then naturally flow to countries with the lowest standards—i.e. to the countries with the lowest barriers to maximum corporate profits. The suppression of collective bargaining is no accident. The elites observed the rise of union power in the mid-20th century, saw it as a threat to their own power and wealth, and devised a successful long-term strategy to put the union genie back in its bottle. Excesses and corruption on the part of some unions diminished public support to some extent, and the elites ingeniously used right-wing talk radio to convince many workers to argue against their own interests. This, combined with the pressure of corporate resistance and government complicity enabled the elites to reestablish their dominance in labor relations. Ronald Reagan's firing of the air traffic controllers was the event that signaled the war was over, and that the elites had won. Over the last decade, the news has seen stories about Mad Cow disease in beef; PCBs in farmed salmon; mercury in tuna and other fish; pesticides on fresh fruits and vegetables and in processed foods; and genetically modified organisms (GMOs) contaminating the seeds from which our non-GMO crops are grown. These and many other food-related problems have crept up on us over time because laws and regulations have been slowly tilted to favor corporate marketing goals over public safety. No elected politician or appointed public servant would ever admit that they write laws and regulations intentionally designed to benefit particular industries (and sometimes even particular corporations or individuals), but the fact that they do just that is the worst-kept secret in Washington and our state capitols. The benefits that are doled out often come at the public's expense in the form of more pollution and less-safe products. For instance, most Americans are unaware that their shopping carts routinely have products that contain genetically modified foodstuffs. Opinion polls have shown that a clear majority of consumers don't want GMOs in their corn chips, French fries, soy milk, and other foods. But there is no label on the products that would allow the concerned consumer to choose non-GMO products (unless the buy organic). This is because the food-industry giants have relentlessly lobbied Congress to prevent GMO labels from being implemented, and US regulatory agencies have followed along with nonsensical rulings such as saying GMOs are "substantially equivalent to" and therefore the same as their non-GMO counterparts and, thus, not subject to separate regulation. The nonsensical part is that the GMO strains are always patented, which means they are unique and, by definition, different. If one "follows the money" on this, the trail leads to food corporations and, ultimately, to the wealthy elites that own and control them. Here's another example: Our waters—and, hence, many of our fish—have become contaminated with mercury because we have failed to insist that power plants and other industrial sources of mercury install state-of-the-art pollution-control equipment. Thus, as government bodies at both the federal and state levels issued repeated safety warnings on mercury contamination in fish, the critical players in the federal government "followed industry orders" and avoided implementing the strongest available mercury-pollution controls on power plants. Because the titans of industry don't want to endanger their profits, our air is dirtier and our fish are less safe to eat. Without getting bogged down in whether the war in Iraq was about oil or whether our policies in the Middle East and Central Asia are about geopolitical hegemony via "energy strength," it is safe to say that oil is a big consideration in our foreign policy decisions. While it's clear that the average person doesn't want war, somehow our leaders seem to keep getting us into military conflicts, especially in regions that are energy-rich. Why? Because war and energy are the most profitable sectors of the economy! To the extent that our military operations further incite terrorists, we are all exposed to dangers that might not exist if different policies were in place. The fact that terrorists choose inappropriate ways to protest our policies does not change the fact that they do protest violently and do cause death and destruction. Of course, we should not let our foreign policy decisions be held hostage to the philosophies of terrorists, but neither should we let foreign policy decisions be held hostage to a continuing need for imported oil or the elites' need to keep the war machine lucrative. Politicians do a lot of jaw-boning about ending our addiction to foreign oil, but it will never happen. It's too late. If we had chosen an aggressive combination of fuel-efficient vehicles and fuel taxation to fund a high-tech mass transit system, we would have had a chance. But that approach would have had to have been active for the last three decades—basically a continuation and acceleration of the conservation and innovation that started in the late 1970s. the fuel economy standards of the 1970s. Campaign contributions did not stop politicians from smartly passing those laws then, but the pol'troons lost their backbone in the 1980s, and they've been driving the bus towards the energy/transportation cliff ever since. One other great example of how plutocracy affects our physical safety relates to chemical plants in the US. After the 9/11 terrorist attacks, there was much concern that US chemical plants would become terrorist targets. An explosion at any given chemical plant could be very serious and might affect hundreds of thousands of people in surrounding neighborhoods. 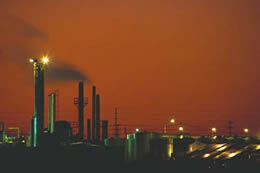 In response, the Senate Committee on Environment and Public Works sent to the Senate floor a draft law toughening security requirements at chemical plants and requiring companies to seek out new techniques that would use less toxic chemicals. The committee vote on the bill was 19-0—a strong show of bipartisan support. Unfortunately, industry groups got wind of the legislation, twisted the arms of the Senate leadership, and the bill magically never came up for a vote in the full body of the Senate. Always keep in mind the insane philosophy of those who live for wealth: Make money on the way up, make money on the way down. There is profit in building up systems, and for those who have the power to manipulate the system, there is profit potential in the breakdown of the system. The promotion of oil use, road building, suburban sprawl, and consumerism was a Money-Go-Round promoted by the most powerful moneymakers in the country. As Peak Oil, the housing crash, and financial meltdown intertwine to begin The Great Unwinding, the elites will be scooping up distressed properties and businesses at cheap prices, consolidating their power and adding to their portfolios as the rest of us scramble to survive. The coordination of elite-driven policy is handled through invitation-only organizations such as the Council on Foreign Relations, the Trilateral Commission, the Bilderberg Group, and a few even-more-secretive organizations. All politicians must become members in good standing before they can be elected to high office. Since all politicians and political operatives want to move up the food chain, they behave like good little plutocrats once in office. The top-level elites exert great influence on government activities from behind the scenes. We like to think the fact that we have regular elections means we the people are in control. But politicians do the bidding of the kingmakers, not the common man. It all sounds rather conspiratorial, but it's all there for us to see—if we choose to look closely enough. Let's be clear: Grinning Planet is OK with the work-risk-reward incentives provided by capitalism. We certainly do not advocate centralized government control of the means of production. However, unrestrained capitalism has little conscience or ethical compass other than the bottom line. Corporations will "eat until they explode"—this much is clear from the financial fiasco that burst forth in 2008, where the world's biggest capitalistic corporations begged to be rescued by the little ol' taxpayer. Grinning Planet is also not opposed to the accumulation of wealth, but we are against the use of that wealth and its inherent power to "rig the system" to ensure additional wealth and power. In theory, governments control the rules of the game, and we the people control the government. But these days, big money talks, and the rest of us walk. let companies that bet big and lose go out of business. Remember, this is not about class warfare, it's about keeping the system fair so things don't get so out of whack that one day we end up with a literal class war. ROLE PLAYERS IN OBAMA’S CABINET — DARK WIZARDS OR WHITE KNIGHTS? Obama's Cabinet — Full of Good People, or Just Full of It? In his stunning memoir, Confessions of an Economic Hit Man, John Perkins detailed his former role as an "economic hit man" in the international corporate skullduggery of a de facto American Empire. Now, in The Secret History of the American Empire, Perkins zeroes in on hot spots around the world and, drawing on interviews with other hit men, jackals, reporters, and activists, examines the current geopolitical crisis. Instability is the norm—the world we’ve created is dangerous and no longer sustainable. How did we get here? Who's responsible? Hey, those rich guys aren't just driving nicer cars than you, they're also healthier and they live longer. The Status Syndrome explains how the economic divide between rich and poor has different "wealth and health" strata, and it suggests solutions that go beyond the normal simplistic suggestions like nationalizing the US health care system. "Capitalism is the astounding belief that the most wickedest of men will do the most wickedest of things for the greatest good of everyone." The global financial crisis is due to a pyramid scam executed on the grandest scale. But many of the perpetrators of the scam are walking away from the mess with millions and billions. This 1-hour BBC documentary reveals how the super-rich schemed to make the con game work—and how they are now relaxing in ostentatious mansions, private jets, and posh vacation spots, with the rest of us picking up the bill. In the meantime, amidst ongoing multi-billion-dollar government bailouts, we ask: How can the current financial system be valid if it allows such things as companies that are "too big to be allowed to fail"?